The airship U.S.S. 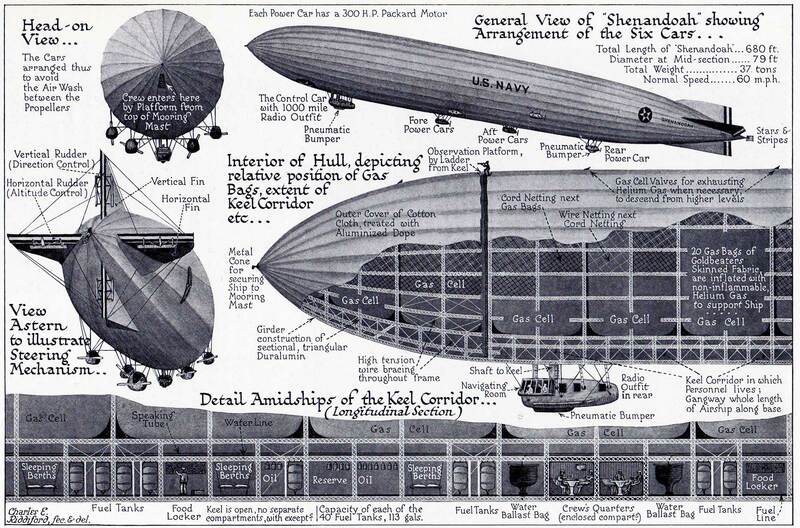 Shenandoah was the first American built rigid airship. Although built in the United States, Shenandoah was based on the design of the German L-49, a World War I high altitude bomber which had been forced down intact in France in October, 1917 and carefully studied. The L-49 was one of the “height climbers” designed by the Germans late in World War I, when improvements in Allied fighter aircraft and anti-aircraft artillery made it necessary for zeppelins to climb to great altitudes to avoid being shot down. For the zepeplins to rise to greater heights on a fixed volume of lifting gas, however, the weight and strength of their structures were dramatically reduced. This decrease in strength was accepted as a wartime necessity, since a structurally weaker zeppelin flying above the reach of enemy aircraft and artillery was safer than a stronger zeppelin that could be easily attacked. The copying of this design for an American airship, however, may later have had tragic consequences. Like all previous zeppelins, ZR-1 had been designed on the assumption that the ship would be operated with hydrogen, but the fiery crash of the U.S. Army airship Roma in 1922 convinced the U.S. government to operate future airship’s with helium, despite the high cost and very limited supply of the gas. ZR-1 made its first flight on September 4, 1923. It was the first ascent of a helium inflated rigid airship in history. Shenandoah’s first flights were on-the-job training for the American Navy, which had no previous experience operating a rigid airship of its own. The Navy also had to learn how to use helium to operate a large rigid airship, which had never previously been attempted. The need to conserve the expensive and scarce lifting gas required flight operations which differed considerably from the techniques which had been developed for operating airships inflated with easily-replaced hydrogen. For example, while the Germans typically began a zeppelin flight with gas cells inflated to 100% capacity, and then valved hydrogen (either manually or automatically) as the ship rose, the Americans — unable to afford the loss of precious helium — had to operate with lower inflation levels, and therefore less lift, and had to be more careful about valving gas to descend or to maintain aerostatic equilibrium. Drawing of U.S.S. Shenandoah from the January 1925 issue of The National Geographic Magazine. The need to preserve helium had many operational implications, including the timing of flights to coordinate with changes in ambient temperature, and the development of water recovery equipment to capture water from engine exhaust to compensate for the weight of fuel burned in flight. And perhaps most significantly, the desire to conserve helium also led to a highly controversial decision to reduce the number of Shenandoah’s automatic gas valves, which became the subject of much debate in light of later events. Airship USS Shenandoah during repairs, March-April, 1924. On the evening of January 16, 1924, Shenandoah was seriously damaged during a gale, when a gust of wind tore the ship from its mooring mast. The ship was grounded for repairs until May 22, 1924, when it was returned to service with reinforcements to its mooring assembly, nose, and fins. The sixth engine in its control car was also removed and replaced with radio equipment, including a long distance direction finding set. On February 12, 1924, while it was undergoing repairs, Shenandoah received a new commanding officer, Lt. Cdr. Zachary Lansdowne. Lansdown, a 1909 graduate of the United States Naval Academy, was one of the Navy’s first officers trained in lighter-than-air aviation. He trained with the crew of the British airship R-34, and became the first American to cross the Atlantic nonstop by air as the American naval observer aboard R-34’s 1919 transatlantic flight. After service as a White House aide, Lansdowne was the Assistant Naval Attache in Germany in 1922-1923, where was involved with the negotiations for the construction of the LZ-126, which became the ZR-3 USS Los Angeles. Lansdowne’s energetic personality and fierce devotion to lighter-than-air aviation would drive the operations of USS Shenandoah and determine its future. Although Shenandoah was too small to conduct extended operations at sea (since the ship’s relatively small gas capacity limited its ability to carry fuel, and therefore its range), Lansdowne was determined to demonstrate the potential of the rigid airship as a naval scouting vessel, and to show that large airships could operate alongside the surface fleet. Lansdowne conducted pioneering operations in which he moored Shenandoah to a mast installed on the support ship Patoka, to show the possibility of underway replenishment and supply to extend the ship’s range and allow an airship to work closely with the fleet, and Lansdowne conducted operations with surface ships such as the battleship USS Texas whenever possible. Shenandoah made one of its most impressive demonstrations in October, 1924, when the ship made a difficult 19-day journey across the United States from Lakehurst to San Diego, via Forth Worth, and then traveled up the west coast to Seattle and back to San Diego, before returning to Lakehurst via Fort Worth. Shenandoah logged 235 flight hours on its headline-making journey across the country, and captured the enthusiasm of both the American public and also leaders in the field of aviation around the world. Upon Shenandoah’s return to Lakehurst the ship was was deflated so that its helium could be transferred to the newly arrived ZR-3 (soon to be commissioned USS Los Angeles) which had just been delivered to Lakehurst by Hugo Eckener and his German crew; the supply of helium was so scare in 1924 that the United States did not have enough of the gas to inflate two large airships at the same time. During Shenandoah’s lay-up, Zachary Lansdowne made a decision which would later be highly controversial. In order to limit the loss of helium by leakage through the automatic valves, and to eliminate several hundred pounds of weight, Lansdowne ordered the removal of 10 of the ship’s 18 automatic gas valves. These valves automatically released helium when as the ship climbed, to avoid over-expansion of the cells at higher altitude, which could damage both the cells themselves and the surrounding framework. Lansdowne’s modification limited the amount of gas that could be valved in a given time, and meant that Shenandoah’s valves could not keep up with an increase of altitude greater than 400 feet per minute; at any higher rate of climb, the ship could not release enough helium to keep up with the expansion of the gas cells. On September 3, 1925, on its 57th flight, Shenandoah was caught in a storm over Ohio. Updrafts caused the ship to rise rapidly, at a rate eventually exceeding 1,000 feet per minute, until the ship reached an altitude over 6,000 feet. Shenandoah rose, fell, and was twisted by the storm, and the ship finally suffered catastrophic structural failure, breaking in two at frame 125, approximately 220 feet from the bow. The aft section sank rapidly, breaking up further, with two of the engine cars breaking away and falling to the ground, killing their mechanics. Two schools of thought developed about the cause of the crash. One theory is that the gas cells over-expanded as the airship rose, due to Lansdowne’s decision to remove the 10 automatic release valves, and that the expanding cells damaged the framework of the airship and led to its structural failure. But Karl Arnstein, the stress engineer who designed the L-49, the zeppelin on which Shenandoah was based, blamed the basic design of the ship, and the decision to operate a ship of that design in adverse weather conditions. Arnstein argued that the wartime L-49 had been designed as a “height-climber;” a zeppelin built with deliberately reduced structural strength in order to lighten the ship and enable it to climb to extremely high altitudes, above the reach of attacking British airplanes and ground fire. The German height-climbers were never intended to operate in difficult weather conditions, Arnstein explained, or over large land masses with their potentially violent updrafts and downdrafts; World War I zeppelins were operated infrequently, when the weather was good, and in the relatively calmer atmosphere over the flat, open ocean. And the very shape of Shenandoah, known as its fineness ration (the ship’s long, thin, pencil-like hull) reduced its ability to withstand bending forces; the next zeppelins designed by Arnstein, the USS Akron and USS Macon, would have a very different profile. The loss of the Shenandoah — and the loss of its officers and crew — was naturally a setback to the Navy’s rigid airship program, but attention soon shifted to the zeppelin which would be the most successful airship in American history, the USS Los Angeles. I believe I have some. I will try to look when I have a free moment. David, thanks for posting. My mother, who was then a child in Barton-on-Humber, told me that she saw that airship crash. Until now I never knew which ship it was. Where can I find more information? Thanks. Have an actual photo of ZR coming out of hangar in Lakehurst. Photo was etched by Clements the photographer.as have a photo of zr entering hangar for the first time. Got to be rare. Shortly after posting my last comment, I realized that I had forgotten about the fact that then LCDR Wiley had also survived the crash of the Shenandoah! Are you aware of anyone else who survived THREE of them? Error: Wiley was not on the Shenandoah when it crashed. He survived the crash of the Akron and Macon. Thank you for once again contributing to the blog, Dr. Marshall!